When it comes to destination, Mabinay Municipality is also known as the next destination by local and foreign visitors. This place is known for having beautiful natural attraction and tourist spot like developed caves and natural spring in the middle of rainforest. Mabinay Municipality is also known as the first class municipality of Negros Oriental, according to 2010 Census. Spring is the number one attraction of Municipality of Mabinay, it is indeed the icon of the municipality where it was recognized as the most beautiful natural Spring in Negros Island. The beauty of this place attracts tourist and local visitors to visit and experiences the coolest place that suits for short vacation. This tourist spot is well preserved and protected by the government and Tourism department to maintain the quality and the standard of this area. This tourist attraction is located at the heart of the municipality, 5 to 10 minutes from Bus terminal. If you are not familiar with the place, it is advisable that you need to take a tour guide. What other things you can enjoy at this place? 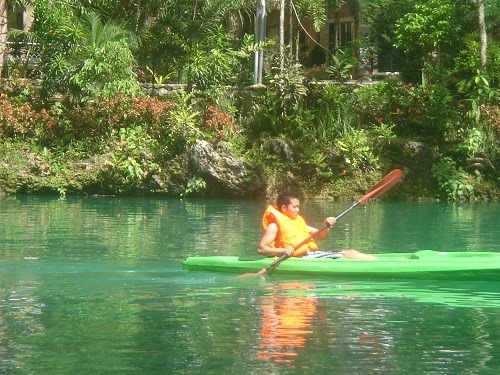 Except from swimming the clear blue water, you can enjoy riding on the kayak too for only Php. 50 you can enjoy roaming paddling around for 1 hour. They have life guard watchers and a simple instruction before you start your kayaking moment. This place has a zipline designed across the spring, for php. 100 you can have 1 long ride from the based to the other side of the spring. Mabinay is situated at the central part of Negros Island in between of Kabankalan city and Bais City. From the capital city of Negros occidental which is Bacolod city, it takes 4 hours to travel riding on a bus. Ceres is the common bus that travels at any part of Negros. From Bacolod City there are two options either to travel directly headed to Dumaguete via Mabinay Ceres liner or you need to take 2 rides, Bacolod headed to kabankalan and kabankalan routed Dumaguete Via Mabinay. There’s few Ceres Liner bus routed directly to Dumaguete, usually people prefer to take Bus routed to kabankalan and take another bus going to Mabinay. From Bacolod to Mabinay it consumes 3 to 4 hours in travel. Once you get there, you have to visit the tourism office for more important information and guides for your safety adventure.